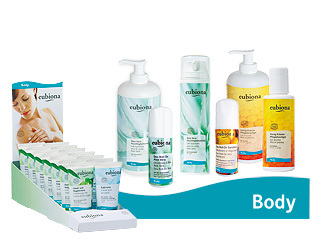 eubiona Body care offers shower gels, body lotions and deodorants with valuable aloe vera, hony and herbs ingredients. The active ingredients included in the special body care products such as sea buchthorn, olive leaf, sage and shea butter, make strained skin areas on elbows, knees, hands and feet soft again. Pure shea butter is also suitable for lips, hair and baby care. The entire skin care will experience totally harmonious and sensuous feeling if treated with eubiona Body Care.